NYC author/writer/actor Larry "Ratso" Sloman has collaborated with some of the most dynamic figures in pop culture from Bob Dylan, Lou Reed, John Cale and Leonard Cohen. Ratso also wrote the best-selling memoirs for Howard Stern, Anthony Kiedis and more. Now at 70, Ratso announces debut LP 'Stubborn Heart' out 5th April on Lucky Number. Hear the first single "Our Lady of Light" featuring Nick Cave here. 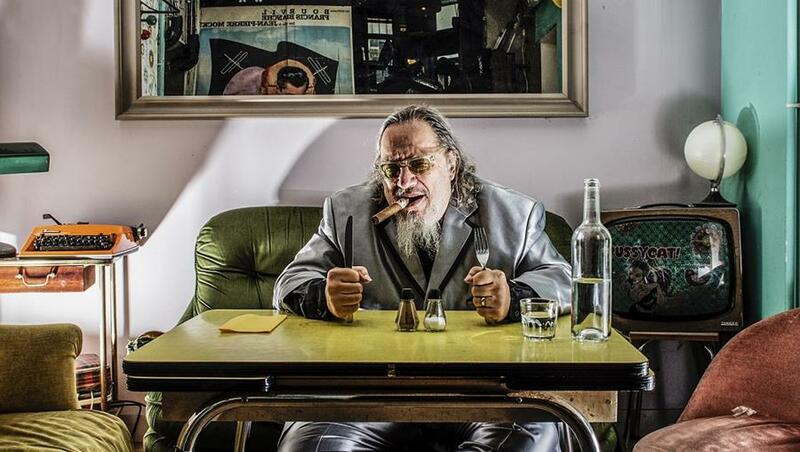 For the last forty-four years Larry “Ratso” Sloman has forged an impressive career as a writer of books, lyrics and, most recently, screenplays. Credited with writing features on the likes of Lou Reed, George Harrison and Leonard Cohen for Rolling Stone, Sloman was also personally invited by Bob Dylan to join his ‘Rolling Thunder Revue’ as the tour's official scribe – leading to his first book ‘On The Road With Bob Dylan’ (dubbed by Dylan as ‘The War and Peace of Rock and Roll”), and being given the moniker of “Ratso” by Joan Baez for his dishevelled appearance. He has also collaborated with the likes of Howard Stern, Anthony Kiedis and David Blaine on their best-selling memoirs, has being personally asked by Leonard Cohen to preface ‘On Tour with Leonard Cohen’, and his biography of Houdini will soon be a major-motion picture. Ratso has also paid his dues in the tower of song, having written the lyrics for over thirty tracks with Rick Derringer (McCoys) and ex-Velvet Underground founder John Cale - including ‘Dying on the Vine’, which became Cale’s signature solo song (inspiring not one, but two novels!) - as well as acting in films as diverse as the award winning short The Black Balloon, the horror film Satan’s Little Helper, and has a large role in Martin Scorsese's upcoming Netflix documentary on Dylan's Rolling Thunder tour, out in April.. What hasn’t he done? His own album. Now in his 70s Ratso is releasing his debut album ‘Stubborn Heart’. Produced by his close friend Vin Cacchione (of Soft Black and Caged Animals) at his studio in Bushwick, Brooklyn, ‘Stubborn Heart’ blends a classic songwriting approach with a contemporary sophistication. The album features Ratso singing on eight originals (including songs that were co-written with John Cale) and what he describes as an “audacious” Bob Dylan cover, along with the generous talents of his friends Nick Cave (who he duets with on the evocative ‘Our Lady of Light’), Warren Ellis, Sharon Robinson (Leonard Cohen’s co-writer, producer and back-up singer), Yasmine Hamdan, Imani Coppolla and more. Reminiscing on the album Ratso says, “Everything about this project was fun. And it was always about the songs. They had been lying dormant since 1984. They deserved a life.” Each track carries a significant and often astonishing history. For instance, the John Cale collaboration ‘Dying On The Vine’, was originally conceived in hotel room off Sunset Blvd. whilst trading lines with Tom Waits and Chuck E. Weiss, whereas Sharon Robinson was convinced to sing on the record in exchange for Ratso writing the aforementioned Leonard Cohen preface for free – described by Ratso as an “old school barter. ‘Stubborn Heart’ is an album that is fittingly autobiographical, harking back to various stages of Ratso’s accomplished career and life, sung by a guy who witnessed the counter-cultural explosion of 1970's NYC and birthed forty years later within the DIY confines of Brooklyn.